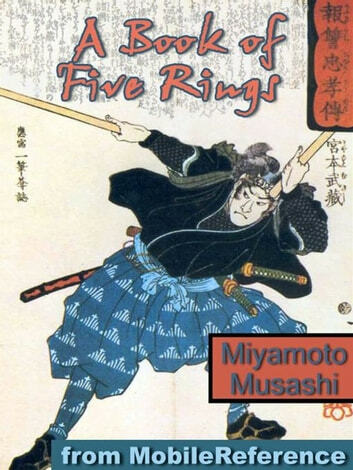 The Book of Five Rings (Go Rin No Sho) is a text on kenjutsu and the martial arts in general, written by the samurai warrior Miyamoto Musashi circa 1645. It is considered a classic treatise on military strategy, much like Sun Tzu&apos;s The Art of War and Chanakya&apos;s Arthashastra. There have been various translations made over the years, and it enjoys an audience considerably broader than only that of martial artists: for instance, some business leaders find its discussion of conflict and taking the advantage to be relevant to their work. The modern-day Hyoho Niten Ichi-ryu employs it as a manual of technique and philosophy.Musashi establishes a "no-nonsense" theme throughout the text. For instance, he repeatedly remarks that technical flourishes are excessive, and contrasts worrying about such things with the principle that all technique is simply a method of cutting down one&apos;s opponent. He also continually makes the point that the understandings expressed in the book are important for combat on any scale, whether a one-on-one duel or a massive battle. Descriptions of principles are often followed by admonitions to "investigate this thoroughly" through practice, rather than try to learn by merely reading. Excerpted from Wikipedia, the free encyclopedia. After reading this, I can see where many people can become interested greatly in the Eastern martial arts, such as kenpo. It piques my interest in learning more of the teahings of The Masters.